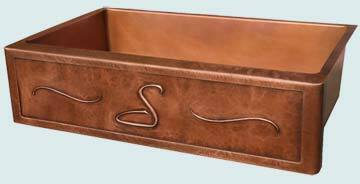 Custom copper repousse apron sinks from Handcrafted Metal add impeccable quality and class to any kitchen, in addition to an unmatched personal touch for your sink. Every feature can be customized, including the number, shape, and size of the bowls, and rims for undermount, drop-in mount, and flush mounting. Choose from additional features, such as backsplashes, drain boards, and towel bars to further personalize your sink. 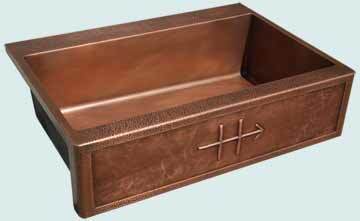 We can even build your custom copper sink with specially radiused corners to exactly match your existing sink cutout in granite! 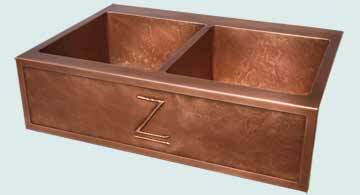 Each copper sink is fully welded and polished, with coved corners inside for easy cleaning, and are made with the purest copper available. Click on any sink below to see more pictures, and customize it according to your specifications! This reverse hammered sink complements the planished texture of the panel in the apron. The R letter and scrolls stretch to reach the ends of the apron. This piece is offered as all reverse hammered. 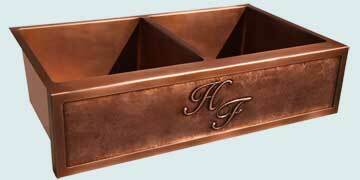 It's made from 16 gauge / 48 ounce copper like all of our sinks, and it has a medium patina. A classic sink, this beautiful piece is a superb addition to any elegant kitchen. The scrolled initial is on a plannished background. A smooth frame and interior makes a lovely contrast to the repousse. Medium antique ages the copper beautifully. Offset letters give this apron a monogram flavor. Our smooth apron frame places a distinct border around our planished background. Two large equal portion bowls add up to a very large sink. It's made from 16 gauge / 48 ounce copper, and has a Medium patina. It fits into a 42" cabinet. 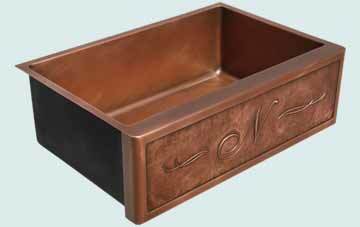 Our reverse hammered copper and outdoor scene lend a strong rustic quality to this sink. We inset the forest scene into heavy borders to provide a substantial, massive quality to the apron. It's made from 16 gauge / 48 ounce copper, and has a Medium patina. 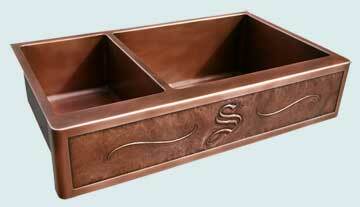 This sink showcases the best of copper and repousse craftsmanship. 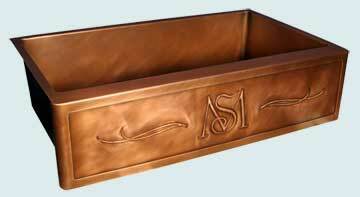 The silky smooth copper of the sink and apron frame matches the smooth surfaces of the S and scrolls. The planished background of the apron provides an organic, almost leather-like texture. It's made from 16 gauge / 48 ounce copper, and has a medium antique patina. This sink fits a 42" cabinet. This sink features Ray's Famous Hammering on the apron frame and top. Our wonderful planished texture behind the repousse creates interest and showcases our hand-made quality. It's made from 16 gauge / 48 ounce copper, and has a medium antique patina. A simple C initial and 2 scrolls on a planished background. The smooth sink interior and apron frame provide good contrast with our sublime planished texture of the repousse background. 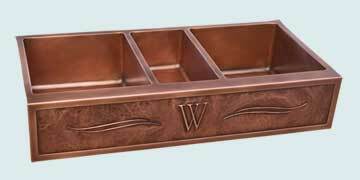 It's made from 16 gauge / 48 ounce copper, and has our medium antique patina. A simple M floats over a planished background. The surrounding frame of the drop-in deck is random hammered. We heavily highlighted the high point on the planishing and hammering for extra emphasis. This piece is made from 16 Gauge copper and has our medium antique patina. 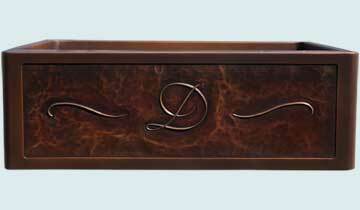 Double scrolls and a hammered frame surround the graceful 'S' initial on this lovely sink. The copper behind the initial is planished with a very fine, light hammer pattern. All hammer patterns are hand-highlighted to show off the texture. This piece is made from 16 gauge / 48 ounce copper, and features our Light antique patina. 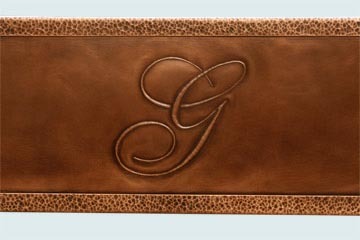 A random hammered frame provides definition at the edges of this 3-letter monogram. The smooth letters make clean outlines against our planished background, and the apron is square on the ends. This piece is made from 16 gauge / 48 ounce copper, and has our medium antique patina. 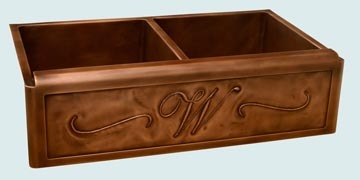 This 2-bowl S initial sink features a smooth interior and apron frame, with our planished background panel on the apron. The 40%/60% bowl proportions provide extra sink space on the right side. 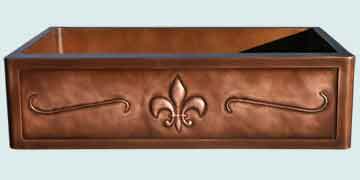 It's made from 16 gauge / 48 ounce copper, and has our medium antique patina. 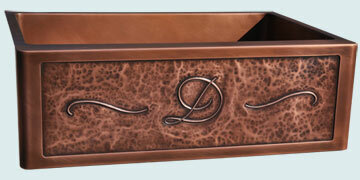 This stunning sink features 3 compartments and a masterfully executed stylized Stallion image. This extra long sink required 3 scrolls on each side of the horse image to fill the space. 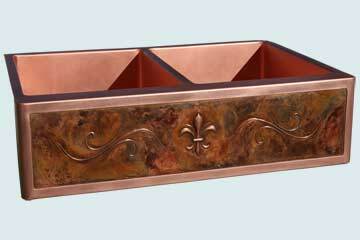 The smooth copper sinks and apron frame contrast the repousse planished panel. The textures and slightly gathered edges of the repousse panel have the feeling of fine tooled leather. This piece is made from 16 Gauge / 48 ounce copper, and has our medium antique patina. A smooth copper frame provides contrast with our fine planished background. The elaborate S and scrolls communicate an air of authority. This piece is made from 16 Gauge / 48 ounce copper, and has our medium antique patina. This single-bowl sink boasts a gorgeous Repousse "D" with scrolls on the apron. The entire sink is made from 48 oz. copper, and has our Dark patina. This stunning double-bowl sink boasts a beautiful Repousee "Z" on the apron. Additionally, the interiors of the sinks are textured with our Ray's Famous hammering. The entire sink is made from 48 oz. copper, and has our Medium patina. This single-bowl sink features a gorgeous repousse "D" on the apron. The entire sink is made from 48 oz. copper, and has our Medium patina.